Rapper DMX was arrested on Wednesday stemming from a speeding incident in January on Arizona's Loop 101. Normally, a celebrity caught speeding wouldn't merit much in the way of newsworthiness but this story has a few interesting details. First, DMX was arrested and charged with multiple crimes including speeding, reckless driving, endangerment and driving on a suspended license. 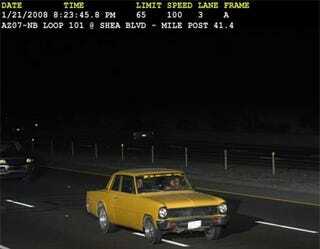 Second, he was driving more than 114 mph at one point when recorded by cameras. Third, he was in a 1966 Chevy Nova II. A Yellow 1966 Chevy Nova II. And how did they ever deduce that it was DMX driving? Other than the images of DMX driving the car, there was one other little giveaway.